A sleeve of beautiful, textured glass in a choice of rich colours is held in a frame of lacy metal. The base of the frame is embellished with a distinctively Turkish crescent moon and star. Choice of glass colours available. 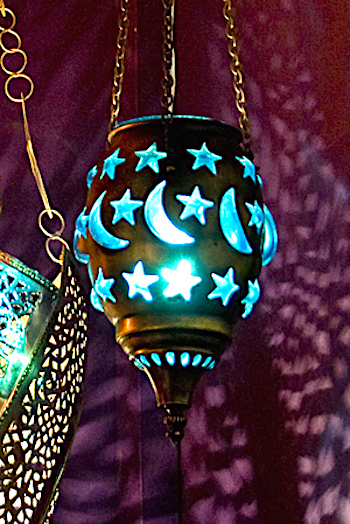 Stars and crescents, but with a distinctively different shape, this lantern is also available in red, blue, green, turquoise or lilac glass, and is just large enough to be electrified. 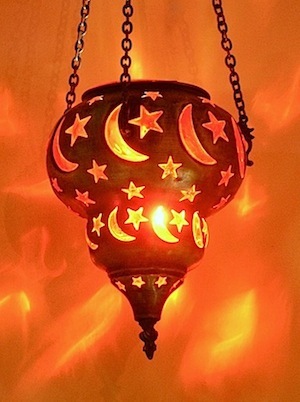 Decorated with a pattern of stars and crescents, this is the quintessential Turkish lantern. 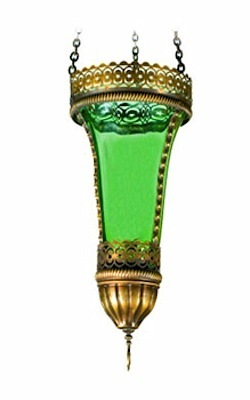 Same colours of glass available as the Sultanahmet, each colour creates a different ambience. The lantern is large enough to be electrified. 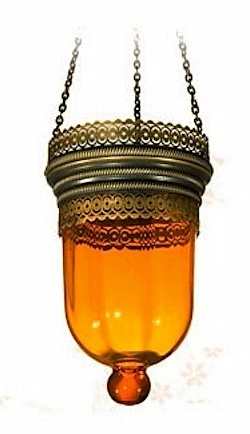 An elongated bowl of mouthblown glass, finished with a traditional glass "bead", is suspended from a double ribbon of patterned, aged brass. This lamp is rated for a 60W lightbulb. A choice of colours of glass is available. Such an elegant shape! 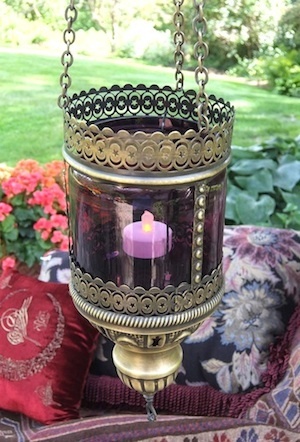 The fluted glass insert is encased in a light frame of aged brass. Ribbons of lacy aged brass decorate the rim and base which terminates in a delicate point. Many colours of glass available. Larger sizes of this lamp are rated for a 40W lightbulb.